It has been called earwax, cerumen, gunk, cat earwax (Japan), and other names, not all complimentary. It is technically called cerumen, and while often thought of as a hygienic nuisance, is far from this, actually representing one our body’s ingenious functional mechanisms, even though scientists are still not certain why we have earwax. It is the intention of this review series of cerumen to show that this sticky secretion has not only clinical interest, but serves as a source of fascination as well. 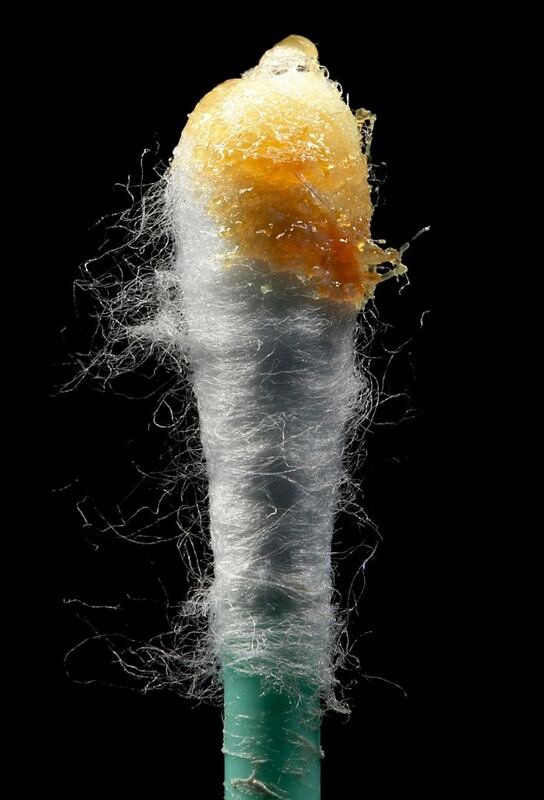 What we see as earwax is a naturally-produced secretion that is reported to be a self-cleaning agent produced in the ears to protect, lubricate, and to provide antibacterial properties. It consists of a mixture of water-soluble viscous secretions – sebum from sebaceous glands and less viscous secretions from modified apocrine sweat glands (Guest et. 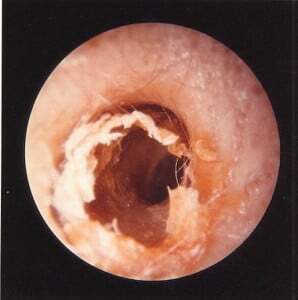 al, 2004), sloughed epithelial cells (dead skin) from the ear canal, hair, dust, and just about any other debris that happens to get “caught” and held together by this “sticky” fluid secreted by ceruminous and sebaceous glands near the opening of the ear canal. Earwax has also been reported to contain other substances, including lysozyme (an antibacterial enzyme), fatty acids, alcohols, cholesterol, and squalene, an oily liquid found in human sebum, especially in wet cerumen (Okuda, et. al., 1991). Depending on how deeply one looks, cerumen also contains amino acids, neurostearic acid, cerotic acid, triglyceride, hexone bases, immunoglobulin, glycopeptide, copper, and other components (Chai and Chai, 1980). Ironically, cerumen is actually not a wax at all. Figure 1. Primary components of earwax (cerumen). Cholesterol ranges from 6 to 9%, and Fatty acids, alcohol, and squalene range from 12 to 20%. 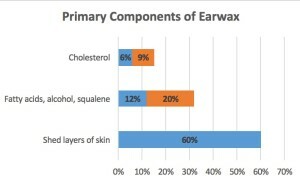 According to Guest et al (2004), the primary components of earwax are shed layers of skin (60% consisting of keratin), saturated and unsaturated long-chain fatty acids, alcohol, squalene (12-20%), and cholesterol (6-9%) – Figure 1.
lubrication of the ear canal to prevent desiccation (drying), itching, and burning of the skin, especially because of the high lipid content of the sebum produced by the sebaceous glands. infection protection by slowing a range of strains of bacteria and fungi growth by incorporating some antibacterial properties to kill certain foreign organisms, whether it be wet or dry cerumen (Stone and Fulghum, 1984; Chai TJ and Chai TC, 1980). These antimicrobial properties are due principally to the presence of saturated fatty acids, lysozyme, and to the slight acidity of cerumen. Interestingly, earlier reports as summarized by Chai and Chai (1980) had suggested that cerumen was unable to prevent infection, and even worse, that the rich nutrients of earwax actually supported luxuriant growth of bacteria and fungi. Their research demonstrated that cerumen had antibacterial activity on each of ten strains of bacteria tested. Figure 2. Migrating sheet of keratin squames mix with the ceruminous secretions, with the whole complex becoming “earwax.” Movements, particularly talking and chewing, are transmitted through the cartilaginous canal and help to loosen the wax which finally leaves the canal spontaneously or with the aid of a judicious small finger or cotton-tipped applicator, but ONLY at the ear canal entrance! canal opening. People are mostly unaware of this cleaning process. Cerumen is a component of the desquamation process where earwax and other debris (dead skin as an example) migrates laterally to the ear canal opening where it usually dries, flakes, and/or falls out. This is a constant transporting action, assisted by chewing and mandibular (jaw) motion (Figure 2). maintains the ear canal’s acid balance, typically a pH of around 6.1 in normal individuals (Roland and Marple, 1997). For certain, the presence of cerumen in the outer part of the ear canal, along with the turns of the ear canal, discourages small particles from reaching, and potentially damaging, the eardrum. Every person produces earwax, but the amount and type are believed to be genetically determined, just as are hair color and height. The amount of earwax produced varies from person to person and has nothing to do with personal hygiene. Some people – mostly men and older people– produce a lot of earwax. Most people have one of two types of earwax – (a) wet, sticky, and yellow-brown to dark brown or, (b) dry, crumbly/flaky and grayish-to-tan). McDonald (2013) has reviewed a number of studies and reported that less than about 1% of the population have earwax that is intermediate or unclassifiable. Earwax type is determined by a single gene variation. The allele (one of two or more alternative forms of a gene that arise by mutation and are found at the same place on a chromosome) for wet cerumen is dominant over that for dry cerumen. Interestingly, Petrakis et al. (1986) found that the proportion of white women with dry earwax increased with age, suggesting that earwax type may not be determined solely by genetics. Figure 3. 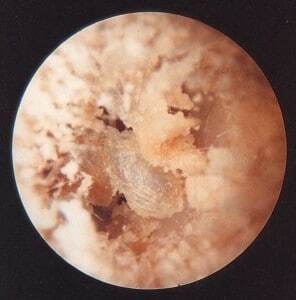 Stages of wet cerumen from a light golden color on the left to increasing hardness and darker color as it ages. Wet Cerumen – When fresh, wet cerumen is soft and yellow, but as it ages it may be brown or even black. It may even look like dried blood (Figure 3). Wet earwax is associated with warmer areas in Europe, Asia, and the Americas (Ohashi et al. 2011), suggesting that there seems to be something about cooler climates favoring the dry cerumen allele. Earwax in children is usually softer and lighter in color than that produced by adults, and although they can produce quite a bit of earwax, it tapers off as they grow older to puberty. It has been reported (Guest et al., 2004) that the consistency of wet type earwax is due to a higher concentration of lipid and pigment granules (50% lipid) in the substance than found in dry cerumen (30% lipid). Figure 4. Dry cerumen (earwax), showing its crumbly/flaky, and grayish-white consistency. View into the ear canal. Dry Cerumen – Dry cerumen is generally dry, crumbly/flaky, and grayish-white (Figure 4). It seems to have originated by mutation in northeastern Asia about 2000 generations ago, and then spread outwards as favored by natural selection. It is common in eastern Asia, and becomes much less common towards Europe, and is rare in Africa (McDonald, 2013). A following post will continue this series on earwax, focusing next on earwax types. Chai TJ and Chai TC. (1980). Bactericidal activity of cerumen, Antimicrobial Agents and Chemotherapy, Oct. pp. 638-641. Guest JF, Greener MJ, Robinson AC, and Smith AF. (2004). Impacted cerumen: composition, production, epidemiology and management. Q J Med. 97-477-488. Ohashi, J., I. Naka, and N. Tsuchiya. 2011. The impact of natural selection on an ABCC11 SNP determining earwax type. Molecular Biology and Evolution 28: 849-857. Okuda I, Bingham B, Stoney P, and Hawke M. The organic composition of earwax. (1991). J. Otolaryngology, Jun:20(3):212-215. Petrakis, N.L., S. L. Wiesenfeld, and L. Flander. 1986. Possible influence of age on the expression of the heterozygous cerumen phenotype. American Journal of Physical Anthropology 69: 437-440. Roland PS, and Marple BF. (1997). Disorders of the external auditory canal. J Am Acad Audiol. Dec;8(6):367-378. Stone M, and Fulghum RS. (1984). Bactericidal activity of wet cerumen, Ann Otol Rhinol Laryngol, Mar-Apr;93(2 Pt 1):183-186. Previous Post Why Are There Holes in My Hearing Aid Battery? It certainly is a good topic. I did not discuss it, but let me know what you were thinking about, and maybe we can do something on that. I saw that, thanks. Is info on ear drying a suitable topic as well? I don’t know, but will look for this information. There will be about 3 followup articles to this, and I hope to answer your question. Number 3 is questionable and I can find no research, as yet, to support this. But, I do have a somewhat humorous post about this that you might be interested in my posts of August 8, 2011 and then the following week. Generic liquid stool softener is the most effective solution to remove ear wax. It is a surfactant, which reduces the surface tension of the substance it is use to soften. IE hard, dry stools, and especially hard dry ear wax plugs. Older physicians, nurses, and pharmaceutical companies have been aware of this off-label benefit for at least forty plus years. The active ingredient is a highly refined soap, and it is been shown to be more effective than peroxide. Look up the active ingredient for the stool softeners Colace or Surfak, and order a bottler of generic stool softener, without food coloring or taste, use the same number of drops as for peroxide, and you will experience improved efficacy in softening and removing problem ear wax. As you know I was not hired at Frye for my knowledge of the Audiology. There are plenty of experts here at Frye already. Here is another one of those really basic bits of knowledge that many of us should know but are afraid to ask. By the way, will I see you at Audiology Now in Phoenix this April? Frye will have a Booth (740) and Dr. Harvey Dillon of NAL will be speaking about Automatic measurement of hearing thresholds using evoked cortical responses on Friday. Come by the booth for a Free Cup of Coffee ! Noted your item 1: “Exposure to cold winds”. When not working at Frye Electronics, Inc. (FONIX Hearing Aid Analyzers) I am a small boat captain. Now I better understand why I have more earwax when teaching sailing than when I inside a pilot house on larger vessels. 1. Exposure to cold winds. Truck drivers typically develop more earwax in the left ear because they drive with the window down, and the air blast damage is prevented on the TM by sporadic build up of cerumen. 2. Exposure to dust, flying insects. Driving in a dusty area on a scooter will cause an abnormal build up of earwax in both ears. This is an established fact in India and other poor countries. 3. Earwax will instantly kill bugs and other insects as it has poisonous properties. Interesting article. Does anyone know if the glands that produce earwax can be affected by radiation treatments? Hopefully there will be followup information regarding the situation that most hearing aid wearers will find themselves in: the default mode of operation for ear wax is disturbed by the presence of hearing aids for 12 – 18 hours per day. After a HOH person emerges from a shower, bath or swimming pool, they must content with wet ears and eager voices that want to communicate with them as soon as possible.